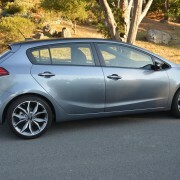 The Kia Forte we drove had 4 cylinders, 5 doors and 6 speeds. All those elements combined to make it number 1 – the best compact sport sedan we have driven so far in 2017. 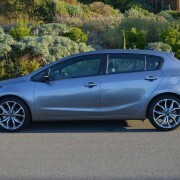 From the outside, the Forte5 is a stunning looker, thanks to the rake produced by a low nose and high tail. Finely chiseled upper and lower belt lines accentuate the illusion of forward motion. 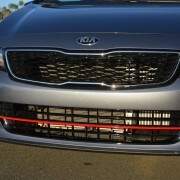 A bold red stripe across the face of the piano black grill confers a sportiness reinforced by red bolstered deep bucket seats. 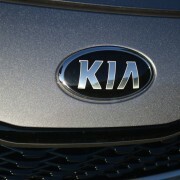 This Kia impresses you up front with its alluring design, and the promise of high performance. 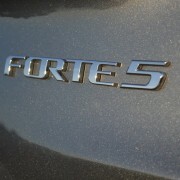 In practice, the Forte5 does not disappoint. 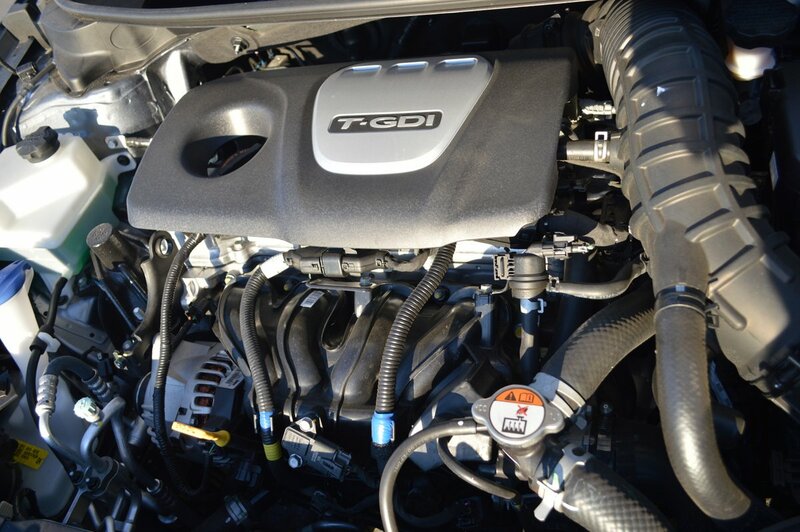 Under the hood lies a turbocharged , direct gas injection, 4 cylinder engine displacing just 1.6 liters. 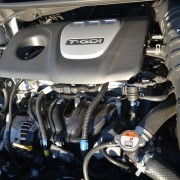 This sideways mounted motor returns exceptionally good mileage, with an overall EPA rating of 25MPG. More important for enthusiast drivers, the little stormer really puts out the power, with 201hp enough to chirp the driven front wheels all the way through first gear. 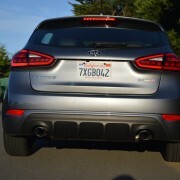 The acceleration doesn’t let up as you snick the 6-speed manual through its precisely designated slots. 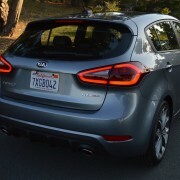 Kia has wisely chosen closely spaced gear ratios, with rpm drops of 500 or less as you upshift through the range. 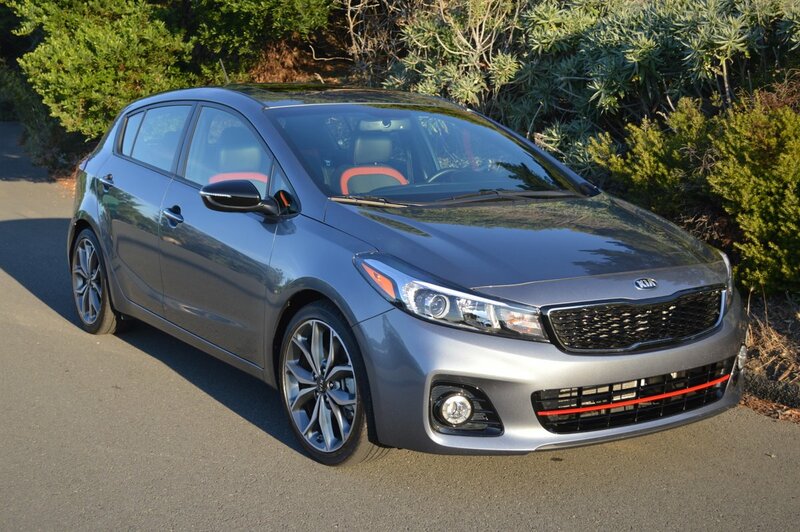 As a result, the Forte5 competently completes any passing maneuver you care to attempt, and proves especially strong at merging with freeway traffic. 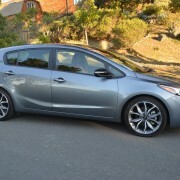 The Forte5 is a Korean designed car. However, it is built in Pesqueria, NL, Mexico. 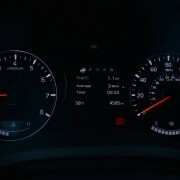 Of the major components used in its construction, only the gearbox actually comes from Korea. 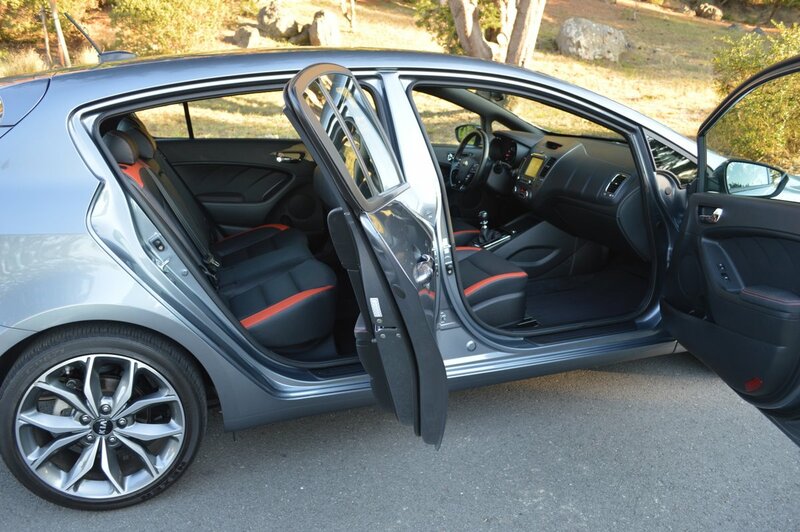 Build quality is excellent, with interior seams that match perfectly, doors that shut cleanly with a resounding thunk, and high class materials used throughout. 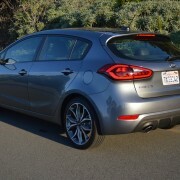 In fact, it should come as no surprise that the Forte model line, along with other Kia vehicles, has won the J.D. Power award for “Best Initial Quality” 2 years in a row. 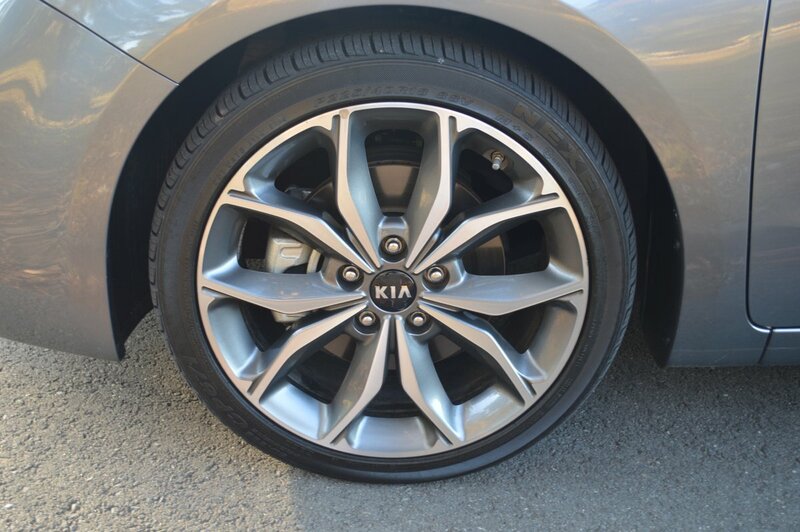 In addition to such celebrated delivery chops, this Kia also carries a 5 year/60,000 mile Limited Basic Warranty, a similar Roadside Assistance package, and 10 Year/100,00 mile Limited Powertra1n Warranty. 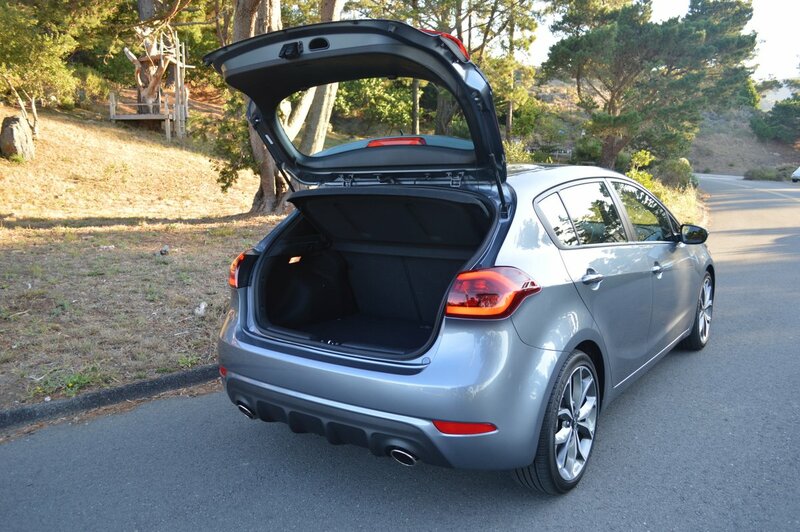 In addition to this long term practicality, the Forte5 also offers plenty of useful travel configurations thanks to that fifth door tailgate/hatchback. 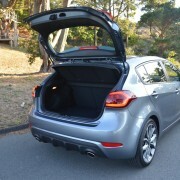 You can drop the rear seats flat for 15 cubic feet of interior storage, or with the seats elevated, carry 4 adults with their belongings hidden inside the fully covered trunk space. 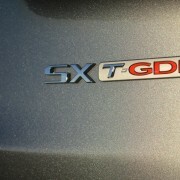 The Forte5 is really a best- of-both-worlds design solution, with a tailgate which does not suffer from the fishbowl display shortcomings of a true hatchback. 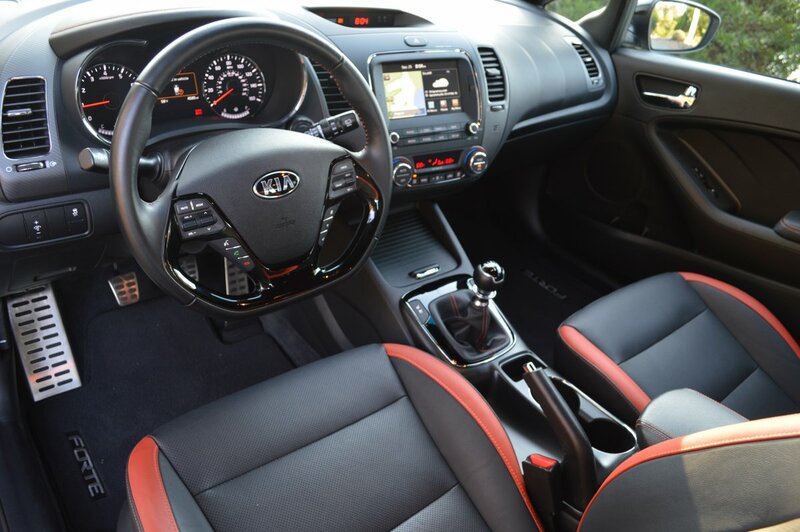 This turbocharged, manual transmission Kia is an absolute blast to drive. 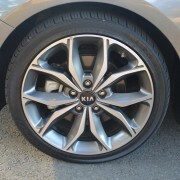 Start at the contact patch, provided by 225/40R18 Nexen CP671 rubber mounted on cleanly styled 18 inch alloy rims. 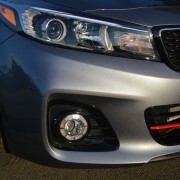 Kia has selected a “Sport-Tuned Suspension” for the Forte5 that maintains a careful balance between comfort and adhesion. The bias here is on the soft side, which results in some slight pitch and wallow over major bumps taken at speed. 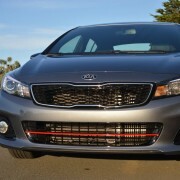 But overall, the net effect is positive, and you can be thankful that this Kia will not beat you up every day with an unduly harsh ride. 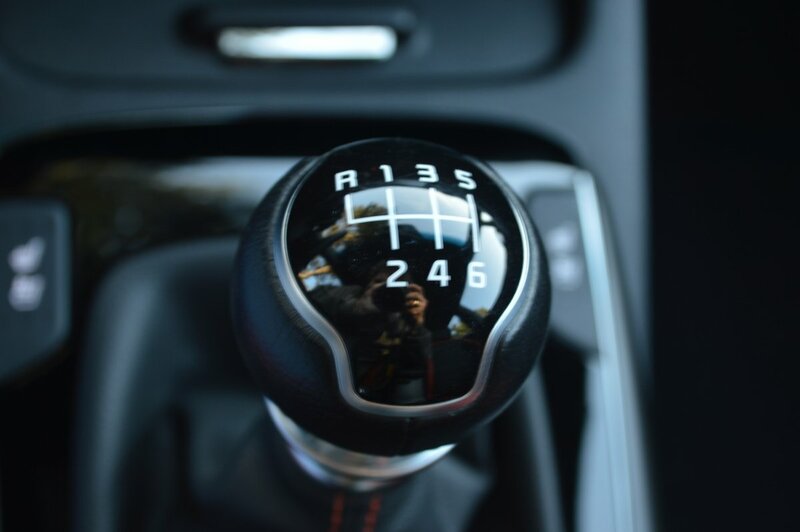 If you do select the manual transmission we enjoyed, you will also appreciate the fact that it offers hill-start control. 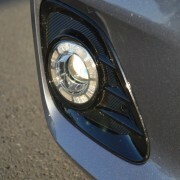 This feature prevents the Forte from sliding backwards as you endeavor to find the clutch engagement point. Even though our test car had logged nearly 5,000 miles, clutch engagement was always crisp and predictable. The gear synchronizers likewise operated with seamless engagement, and it was never a challenge to find the right slot for the right gear. 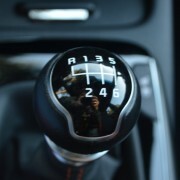 A lift-up ring below the shift knob needs to be raised to engage reverse gear, an easy operation that prevents mistaken selection of reverse. Steering is pleasurable thanks to the deftly contoured, flat bottomed, racing type steering wheel. While its spokes are festooned with the usual array of Bluetooth/Audio/Cruise controls, the wheel itself feels just right when you are carving apexes with those sticky Nexen tires. 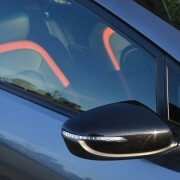 Steering feedback is exceptional, and the Forte responds to every twitch with an equivalent change in direction. 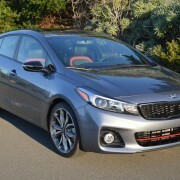 This is way more response than you would expect from a 5 door family sedan costing just $27,020 all in.